He said he had not left National in the lurch by going to Act, despite having agreed to work for the party again. Yes John, I’m sure they have. It’s not surprising that Ansell has ended up with the party of the extreme right, because as anyone who knows Ansell will tell you he actually talks like the comments section of Kiwiblog. Conversation with him is littered with terms like “Helengrad” and “nanny-state” and he is a reasonably regular commenter there. We’ve also been graced with his comments here at The Standard which ended with the PR man being firmly handed his arse by a couple of our more aggressive commenters. Always a bad sign for a “pro”. But don’t worry, John’s got a new vision for ACT and a whole new slogan, ‘Ripping the Guts Right Out of New Zealand’ ‘The Guts to Do What’s Right’. Now I’m not saying that’s a stupid catchphrase but, nah, I’m saying that’s a stupid catchphrase. I wish ACT all the luck Ansell brought the FSC. i’m sure they tried that phrase with Dr Brash – just before he was forced to stand down. I seem to recall hearing about an ad run in Taupo from a friend of mine there. Can’t say it quite worked out as planned in that instance. My favourite bit of the whole ACT show, was Douglas’ statement that he got back into politics because he thought NZ needed some ‘fresh ideas’. Is that a repudiation of Rogernomics? When you are the reanimated remains of leathery hide and withered soul “fresh” takes on a very relative meaning. Didn’t Ansell work for Labour a while back? Yeah, then he left them because he was worried they were returning to their roots. You’re right about one thing. There haven’t been any successes for Freedom of Speech lateley. Are you Standard folk forgetting that Ansell did the 1993 Labour campaign? You know, when Clark was in charge? I know Mike, I’m concerned about John Key stopping that reporter from speaking too. In 1993 Mike Moore was still Labour leader (Clark ousted him a month after the election). Ah, true. Still, a little strange to go from Labour in ’93, to ACT. Not really. They were still quite a right-wing party at the time. Look at Mike Moore’s columns in any major daily. Still staunchly a Labour supporter though, just doesn’t support Clark/Cullen. I couldn’t ever see him jumping to another party. Surely given his ideological bent he would have been backing the party of Ruthanasia by that stage? A National – Maori Party deal would be difficult, but just possible. An ACT – National – Maori deal would be a three-way suicide pact. Slippery John’s going to have to choose between the two, and it’s pretty obvious who he’ll be making eyes at (hint: not the ones who are out to take National votes). Personally I welcome Douglas back with open arms. The bitterness and poison he puts forth are a great advertisement for ACT. ‘Roger Douglas as Associate Minister of Finance in a Key led govt’. Vote for a National Govt & get the bonus of Roger Douglas back at the hands of government. What do you want sold next NZ, hospitals, schools? 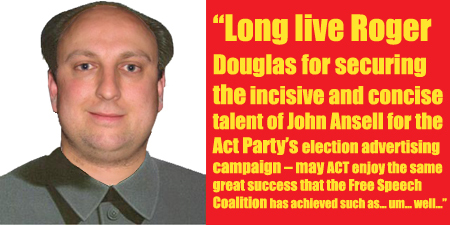 Key will be quite careful to distance himself from the extreme policies of Douglas, no question. Hes been so so careful to try and close down ANY suggestion of extremism in National. It will be nice to point out to voters how Key will also bring Roger Douglas back into Parliament. Couldn’t be Jim Anderton you’re talking about there, could it? No, because he’s friends with Labour. Give me a break. Irishbill, your double standards are absolutely breathtaking. Your sense of humour’s not getting any better Dean. Yeah, but they still smell bad, personal hygine tends to be lost on the left.